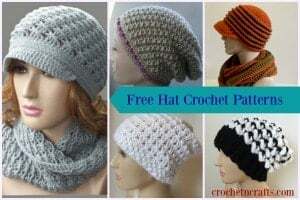 This is a super quick modification on my easy breezy beanie pattern. It’s the perfect summer beanie as it’s open and lacy so you won’t get too hot wearing it. It’s a stylish way to keep your hair up and in place on any day – whether rain or shine. Basically all I did was increase the number of repeats of round 10 in order to create a slouchy hat. I also added a note there that if you need a wider hat to continue with more increase rounds. And for a deeper hat, simply do even more repeats of round 10. Also, for the original pattern I used Red Heart Soft Touch. But for the above I used Loops & Threads Soft & Shiny. It’s a nice soft yarn and drapes well. Any similar soft yarn will work for this beanie but I’d advise against anything sturdy like impeccable or the super savers and super value yarns. I crocheted one hat with the Impeccable and it didn’t drape well at all. At the same time, after a few washes it might come out looking nice too, so it’s up to you what yarn you want to try. Hope you enjoy the updated version. Gauge: 3″ over first 4 rounds. Finished Size: When laying flat it measures 10″ across the brim and 7″ from top to bottom. It’s nice and stretchy; it fits my small head but will stretch to fit a medium and maybe even a large head. 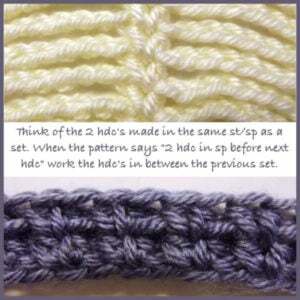 Note: When you work 2 hdc’s into the same stitch or space, think of these as a set, or a mini shell. Then when you crochet your next round and the pattern says “2 hdc in sp before next hdc”, work these in between the previous set of hdc’s. Below are two images that might help. For a wider hat continue with more increase rounds. Rnds 11-27: Same as rnd 10. Rnds 29-31: Working into bl only, ch 1, sc in first st and into each st around; join with sl st in first sc. (80 sts) FO at last rnd.